Israel's Parliament has passed a law preventing Palestinians who marry Israelis from living in Israel. The move was denounced by human rights organisations as racist, undemocratic and discriminatory. Under the new law, rushed through yesterday, Palestinians alone will be excluded from obtaining citizenship or residency. Anyone else who marries an Israeli will be entitled to Israeli citizenship. Now Israeli Arabs who marry Palestinians from the West Bank or Gaza Strip will either have to move to the occupied territories, or live apart from their husband or wife. Their children will be affected too: from the age of 12 they will be denied citizenship or residency and forced to move out of Israel. Amnesty International and Human Rights Watch sent a joint letter to the Knesset, Israel's parliament, urging members to reject the bill. "The draft law barring family reunification for Palestinian spouses of Israeli citizens is profoundly discriminatory," Amnesty said in a statement. "A law permitting such blatant racial discrimination, on grounds of ethnicity or nationality, would clearly violate international human rights law and treaties which Israel has ratified and pledged to uphold." B'Tselem, an Israeli human rights organisation, joined in the criticism of the law. Yael Stein, a spokesman, said: "This is a racist law that decides who can live here according to racist criteria." Some Israelis believe they are sitting on a demographic time bomb, with an Israeli Arab community, already 20 per cent of the population, growing faster than the Jewish population. The discrimination is not only against Palestinians, according to human rights groups, but against Israel's own 1.2 million citizens of Palestinian origin as well. The overwhelming majority of Israelis who marry Palestinians are the so-called Israeli Arabs - Palestinians who live in Israel and have Israeli citizenship. "This bill blatantly discriminates against Israelis of Palestinian origin and their Palestinian spouses," said Hanny Megally of Human Rights Watch. "It's scandalous that the Government has presented this bill, and it's shocking that the Knesset is rushing it through." The government pushed the vote through at speed, even agreeing to consider it a vote of confidence to get it through. It was passed by 53 votes to 25, with one abstention. Gideon Ezra, a cabinet minister, said: "This law comes to address a security issue. Since September 2000 we have seen a significant connection, in terror attacks, between Arabs from the West Bank and Gaza and Israeli Arabs." Since 1993, more than 100,000 Palestinians have become Israeli citizens through marriage, Mr Ezra said. But B'Tselem pointed out that only 20 of those 100,000 have been involved in suicide bombings or other militant attacks. Human rights groups said security concerns could not justify the new law, which amounts to collective punishment. Noam Hoffstater, another spokesman for B'Tselem, said: "Those who voted for the bill and those who support it are making a very cynical use of security arguments to justify it, even though they used no data. This in fact was a cover for the real reason, which is the racist reason, the demographic reason." Many on Israel's right fear that it will be impossible to maintain Israel's identity as an officially Jewish state if the Arab sector becomes too large. "Today I lost hope," Sa'id abu Muammar, an Israeli Arab, told Reuters news agency. He has been hiding his Palestinian wife from the police since their marriage a year ago. "This is what we've been doing and this is probably what we will have to continue to do." Morad as-Sana and his wife Abir returned home from their honeymoon in Istanbul last Saturday to the news that the Israeli parliament had passed a law two days earlier that will make their planned life together impossible. As the young couple crossed back over the land border from Jordan to Israel, they parted ways: Abir to her family in the West Bank city of Bethlehem and Morad to his apartment in the southern Israeli city of Beersheva. Neither knows when they will be able to see one another again. Farahti with three of their four children. even though he has been married to Samar for eight years. The enforced separation is the result of legislation rushed through the parliament last week on the orders of Prime Minister Ariel Sharon, before the Knesset's summer recess this week. Sharon made the new law -- an amendment to the Citizenship Law barring Palestinians from joining a spouse to live in Israel -- a vote of confidence in his government. The measure was approved by a wide margin last Thursday. All Palestinian applicants will now be refused residency permits and access to the naturalisation process that would lead to citizenship. Thousands more Palestinian spouses who are already living in Israel -- and their children -- face an uncertain future. They will have pending applications for citizenship frozen or refused, and unless they are allowed residency status they too will be forced to separate from a husband or wife. The law provoked almost universal condemnation as "racist" from international and local human rights groups. Btselem, an Israeli rights group, pointed out that it contravened Israel's basic laws on equality as well as the Declaration of Independence, which pledges the state to "ensure complete equality of social and political rights to all its inhabitants irrespective of religion, race or ethnicity". Before the vote, Amnesty International and Human Rights Watch submitted a joint letter to the Knesset urging its members to reject the amendment on the grounds that it is discriminatory and violates international law. Even the minister responsible for the new law was apologetic. At an earlier stage of submitting the legislation, Interior Minister Avraham Poraz said of the measure initiated by his predecessor: "It would be best if the bill never made it to the law books, because an enlightened and humane society should allow reunification of families." The law only affects Palestinians and will not apply to other foreigners marrying Israelis. Most Palestinians seeking citizenship are married either to one of Israel's one million Arab citizens, or to one of the 220,000 Arabs in East Jerusalem. The measure is being introduced for a one-year period but can be renewed annually -- and many observers suspect that, once the initial outrage dies down, it will become a permanent feature of the statute books. Morad and Abir, like thousands of other couples, now face a heart-breaking future. Abir, a 27-year- old lecturer in social work, is barred from living with Morad in his home in the Negev; and Morad, a 30-year-old lawyer, is prohibited from moving to Bethlehem by army regulations that ban Israelis from entering Palestinian-controlled areas. "The state is making it impossible for us to be together," said Morad. "I am an Israeli citizen and this is supposed to be my state. What other country treats its citizens in this way?" Paradoxically, the couple met at McGill University in Montreal, Canada, in 2000 on a masters programme on peace-building, co-sponsored by the Israeli Embassy and designed to encourage Israelis and Palestinians to trust each other. "What message does this send me and other Arab citizens apart from that our government not only doesn't trust the Palestinians but it doesn't trust us either," said Morad. Orna Kohn, a lawyer with the Adalah legal centre for the Arab minority in Israel, said she had not heard of any other country apart from apartheid South Africa that had enforced such a law. "What are couples in this position supposed to do?" she said. "Maybe the state should prepare special prisons so that they can live together. Or maybe it really wants them to leave the country and live abroad." Other critics took a similar line. "We see this law as the implementation of the transfer policy by the state of Israel," said Jafar Ferah of the Mossawa political lobbying group. Israel's official justification for the new measure, however, is that it is needed on security grounds. The government claims that 20 Palestinians with Israeli citizenship have been involved directly or indirectly in terror activities during this Intifada, using their blue ID cards to move around freely. Echoing a by-now familiar government position that the country's Arab minority harbours scores of terrorists, Gideon Ezra, a cabinet minister, said: "Since September 2000 we have seen a significant connection, in terror attacks, between Arabs from the West Bank and Gaza and Israeli Arabs." However, Adalah, which is petitioning the Supreme Court to have the new legislation overturned, challenges the state's arguments. It points out that the government has repeatedly avoided providing details of these 20 cases. When pressed by the court in April, the state produced only six examples. Adalah also observes that the figure is tiny as a proportion of the thousands of applications for citizenship. Palestinians passing through the naturalisation process are already subjected to stringent security tests. "The current law grants the government wide authority to conduct criminal and security background checks on all persons seeking to gain citizenship or residency status in Israel," said an Adalah spokesman. Morad makes a further point about the discriminatory and sweeping nature of the measure, referring to two Britons who set out on a suicide mission to Tel Aviv in April, one of whom successfully detonated his bomb and killed three diners. "On the logic of this law, no one with a British passport ought to be allowed into the country. Where does it stop?" Others suggest that the measure could rebound on Israel, driving couples underground and making it even harder for the security services to keep track of what they are doing. The bogus nature of the security justification is suggested by the experiences of some 14 families whose cases are being handled by Adalah. 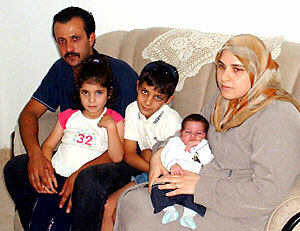 Ahmed and Samar Farahti, for example, have been married since January 1995 and now have four children, the youngest only a month old. They are distant cousins whose families were separated by the war of 1948 that created Israel. Ahmed's family is from Jalameh, a village close to Jenin, while Samar lives in Sulam, a village 10km away in northern Israel. Samar, aged 27, has been applying for citizenship for her husband at the nearby Afula office of the Interior Ministry for eight years without success. Ahmed, 30, was given a series of six-month permits to stay in Israel starting in July 1996, although the renewals were intermittent. In November 2001 his request for temporary residency was finally granted, although no action was taken by the authorities. He is currently facing deportation to the West Bank, although the courts have put the order on hold while they consider his case. "We were married years before the Intifada," said Samar. "If my husband was a threat to the state, either he would have done something by now or the Shin Bet [security services] would have the evidence against him." Ahmed has not been able to see his elderly parents in Jalameh for 18 months, even though they are a 10-minute drive away and his father is ill with cancer. "I have been told if I leave Israel and go to the West Bank the army will not let me return," he said. Hanging over Samar and the four children is the constant threat that their father may be arrested any day and escorted back to the West Bank. "How can we get on with our lives when we have to live like this?" said Samar. The harsh treatment of families like the Farahtis is the result of an administrative decision taken more than a year ago by the Israeli government which is only now being enshrined in law. It reveals much more clearly the true thinking behind the legislation passed last week. In April 2002 the then interior minister, Eli Yishai of the ultra-Orthodox Shas Party, froze all applications from Palestinians for what is known as "family unification": the right of Israelis to bring a spouse of a different nationality, and his or her dependents, to Israel to live together. Although Yishai cited "security" grounds for the decision, his real concern lay elsewhere. Four months earlier, in January 2002, he was reported by the Israeli newspaper Ha'aretz to have been seeking statistics from his ministry on how many Palestinians were trying to acquire Israeli citizenship through marriage. By early March he was reported to be disturbed by the findings: according to his officials, 22,400 Palestinians had requested "unification" after marrying Arab citizens in the decade since the signing of the Oslo accords. Each had brought with them on average a further three relatives, meaning 100,000 Palestinians were in line to receive citizenship. In fact, the rise in applications was the result not of Oslo but of the policy of general closures -- the sealing of the borders between Israel and the West Bank and Gaza -- imposed by Israel in the aftermath of the 1991 Gulf war. Palestinians who had previously been able to move freely between the occupied territories and Israel were now required to seek permits. Arab citizens who had married a partner from across the 1967 border quickly became aware of the legal importance of getting citizenship for their Palestinian spouse. Applications started to pour in. In fact, as the Farahtis' experience shows, the Israeli authorities had hoped to delay citizenship in most of these cases indefinitely. But their hand was forced by a Supreme Court decision in 1999. Known as the Stamka ruling, the judges decided that anyone marrying an Israeli citizen was entitled to equal treatment in the processing of their application, unless they had a criminal past or were a security risk. On this basis, Palestinians like other foreigners would be entitled to citizenship after a four and a half year naturalisation process. Yishai and others, including the prime minister, were said to be deeply troubled by the demographic threat such a development would pose to the "Jewish character" of the state. The one million Arab citizens of Israel already comprise a fifth of the total population, and their numbers are expected to rise steeply in the next few decades. Various ministries have been investigating ways either to limit the growth of the Arab population or raise the birth rates of Jewish women. Last year, for example, the Welfare and Labour Ministry reconvened the Demography Council, disbanded six years ago after its work was described as racist. The council of lawyers, educators and gynaecologists is charged with devising ways to increase the fertility of Jews as a way to preserve their ethnic dominance of the state. Yishai too asked his legal advisers to find a solution to the "post-Oslo marriage boom". They suggested several options, including limiting the number of non-Jews receiving citizenship annually and barring citizenship to anyone who had previously stayed illegally in the country (including tens of thousands of Palestinians caught crossing into Israel illegally to look for work after the closures were imposed). But a suicide bombing carried out on 31 March 2002 at a restaurant in Haifa by Shadi Tubasi, a Palestinian from Jenin married to an Israeli Arab, offered Yishai the chance to implement his preferred option. The next day he froze all applications for family unification from Palestinians, plunging thousands of couples and their children into an immediate state of legal limbo. Six weeks later the government retroactively approved Yishai's measure, saying it would apply indefinitely until new legislation could be passed. More than $5 million was allocated to the police and Interior Ministry to enforce the new regulations. There is little doubt that Sharon was one of the prime movers in this episode: since he formed his second government in February, he has taken charge of just one ministerial committee -- that dealing with the non-Jewish population. Under Yishai's regulations, the situation of each applicant was frozen at the point he or she had reached in the naturalisation process on 12 May 2002. Farahti had been promised residency in November 2001 and was due to meet officials first in April and then in May 2002, but both appointments were cancelled. On the government's imposed date, Farahti was effectively living in Israel illegally. He has not been deported only because Adalah has been able to win an injunction from the courts while the judges consider his case and the petitions of 13 other families. Orna Kohn, the lawyer handling the cases, says: "The judges have been delaying this petition for a year to see what the government would do about changing the law. Now the law is clear. But we hope to show that it violates basic rights enshrined in Israeli and international legislation." Kohn points out that even in the cases of Palestinians who have received temporary residency their families' lives have been scarred. "With just temporary residency and no hope of citizenship, it is very difficult to find work, rent an apartment, open a bank account or get a mortgage." She also questions the figures produced by the Interior Ministry. Although it cites 22,400 cases of Palestinians seeking unification, it has refused to confirm or deny whether these are all separate applications or include multiple applications. As many Palestinians applying for residency are regularly turned down, like the Farahtis, there is a strong likelihood that the figure is inflated. The government's bad faith in attributing the new policy to security is also revealed by reports in the Israeli media that in late May Sharon, backed by the Shin Bet and the attorney-general, Elyakim Rubinstein, asked the Justice Ministry to formulate another amendment to the Citizenship Law. This one would strip citizenship from children born in Israel to a mixed Palestinian-Israeli Arab couple.